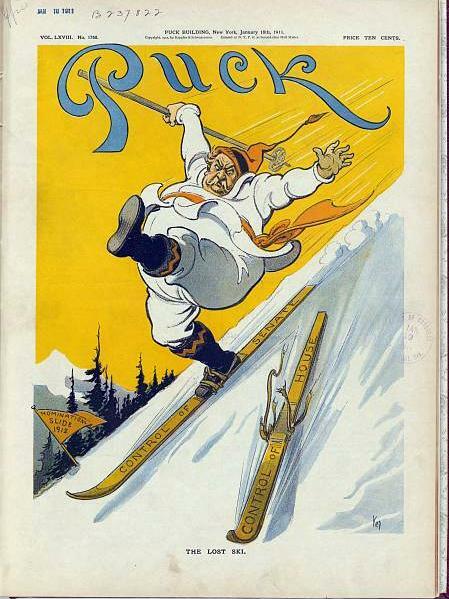 I was going to try to do a combined Presidents Day/Olympics post but our commanders in chief seem to prefer fishing, shooting, golf and tennis to winter sports: I found a few images of Vermonter Calvin Coolidge on skis, but on the snow-less White House lawn! We want our presidents to be sportsmen now, and so there are countless photographs of President Obama shooting hoops, President Bush (43) chopping wood, President Clinton running, President Bush (41) on his cigarette boat (an image I grew up with in southern Maine) and all of the above playing golf. Every twentieth century president seem to be an avid golfer with the exception of Teddy Roosevelt, who considered golf a sissy sport. 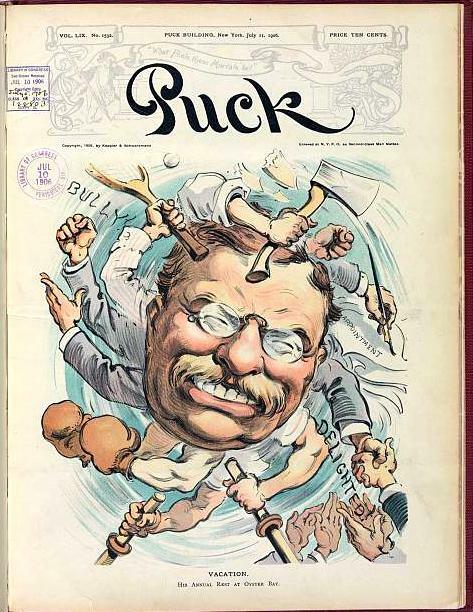 Teddy is often considered the transitional president by “presidential historians” (I hate that media made-up term): his aggressive and very public sportsmanship made it not only acceptable but nearly necessary for his successors to be as athletic and outdoorsy as possible. 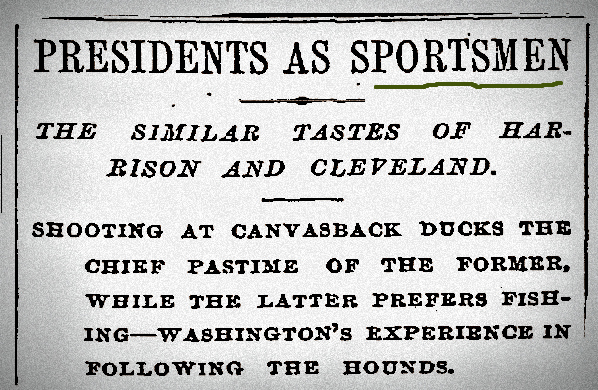 I think the President as Sportsman ideal precedes Teddy by about a decade, and is illustrated nicely by an 1892 New York Times Article which compares the two candidates in the forthcoming election on their “sporting tastes” (basically hunting and fishing). This article (published on September 11, 1892) is quite hilarious, and for the most part praises the athletic pursuits of not only Cleveland and Harrison but also presidents past, with the exception (I think) of Andrew Jackson: There is no word to show that he ever fished, and it is highly improbable that he did so. Fishing is a pastime that requires patience, and if there was one quality in the world that Andrew Jackson did not possess it was the quality of patience. With shooting it was different. 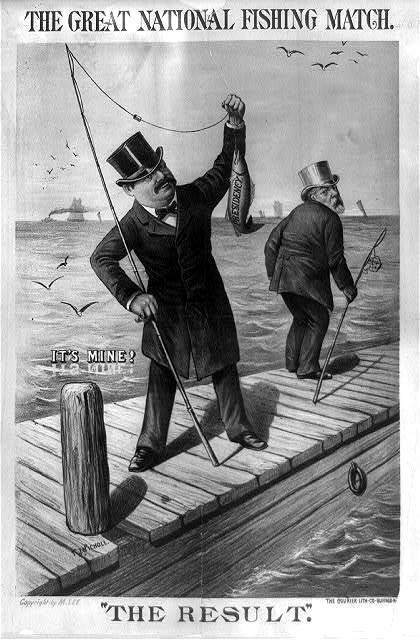 That is, killing violently, and Jackson must have found excitement in it.” Two presidents in particular, John Quincy Adams and Chester A. Arthur, are singled out for their sportsmanship: Adams is “the great swimming president” as well as “the great pedestrian president”, while Arthur is “one of the most thorough sportsmen that has ever been in the White House.” This is the view of 1892, but there is ample evidence that both presidents were criticized for their pastimes in their own times: Adams’ fondness for billiards was an issue in the 1828 election, and Arthur the Sportsmen was the object of constant caricature a half-century later. 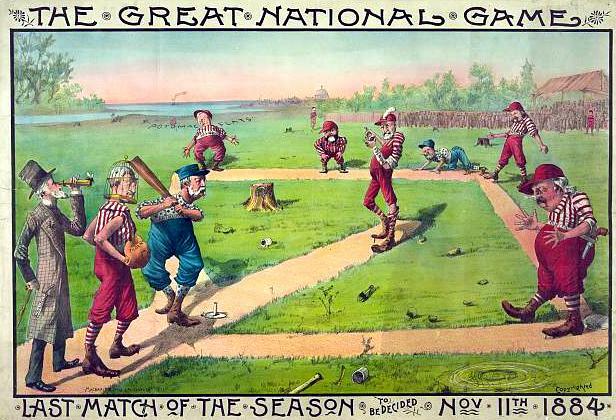 Chester A. Arthur, the sportsman President, at bat in “The Great National Game”, 1884 (Macbrair & Sons) and “The Great National Fishing Match/The Result”, 1885 (Courier Lithograph Co.), Library of Congress. 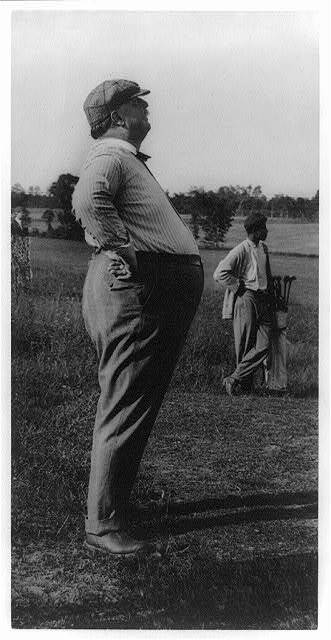 After Arthur, and just before Roosevelt, it is President William Howard Taft who seems to have been portrayed most often as avid sportsman by the press: the sight of his imposing presence on the field–or on the slopes– must have been irresistible. 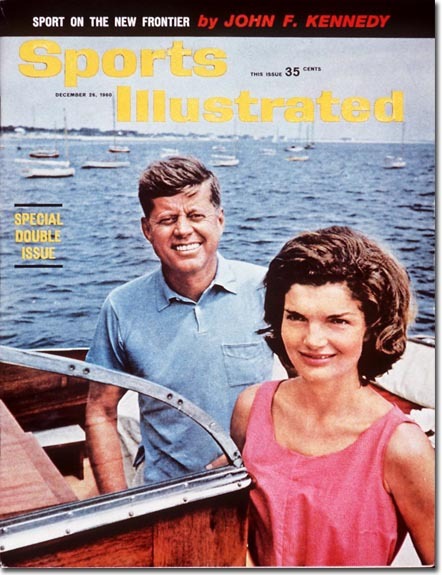 Teddy’s exploits must have changed the perceptions of the presidency quite radically, in much the same way that JFK’s public passion for sport did later on: for both men, sport was a matter of both policy and perceptions. This entry was posted on Sunday, February 16th, 2014 at 8:46 pm	and tagged with ephemera, holidays, Presidents, Presidents' Day and posted in Culture, History. You can follow any responses to this entry through the RSS 2.0 feed.